Here at AnswerConnect, we believe that businesses are responsible for more than just making money. We adhere to what’s known as the Triple Bottom Line. We consider People and Planet to be as important as Profit as we judge our success as a business. For anyone who has never heard of the triple bottom line concept, I will try to explain how this affects everyone. Companies that follow the triple bottom line concept of doing business think about the impact their actions have on all the people that are associated with them. This can include farmers supplying raw materials, on up to the chief executive of the company. Everyone’s well-being is taken into consideration. A healthy, safe place to work. Opportunities for progression and education. A work environment free of exploitation. In some cases, the “social” bottom line also includes the community where the company is based. In 1994 John Elkington coined the phrase “The Triple bottom Line”. Economy – Profit, growth, revenue and cost. Social – People, employee welfare, fair trade and charitable contributions. Environment - Planet, resource consumption, land use and waste management. 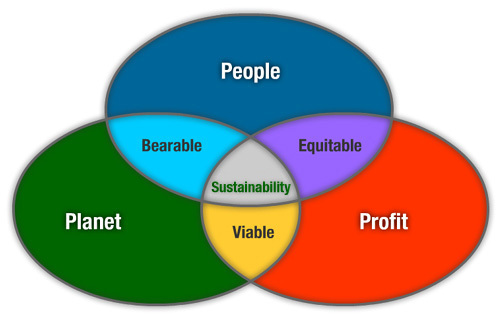 All of which make up the sustainability of a company. It is important for any company to make a profit. It is why people go into business. But it is also important to make sure that your company policy is ethical and responsible for the social and environment part of the business. It makes sense to have a sustainable business policy. Our planet has limited resources. It is only a matter of time before it is gone. In the UK , for example, we have seen a decline in the steel and coal industries. Thousands of people lost their livelihoods. Whole communities and local businesses were hit by the fallout, because companies were not looking at the bigger picture. The damage is done, but because more companies are starting to use the triple bottom line concept, there is a chance to rebuild, repair and set a target for all other companies that think profit is the only bottom line. I am proud to be a part of a company that has the triple bottom line as its core business plan. Our founders’ initial idea was to build a company around this concept. This was because they did not think the government was doing enough to improve the ethical decisions for companies to be responsible for the sustainability of their business. Looking after our planet and the people who live on it should be the responsibility of everyone. Having everyone involved is important to make it work. How much impact is your employer having on the planet? How is your company making a difference for the good of your community? There are so many ways we can help, and with just a little research we can improve the triple bottom line of each and every company. The future of your children and your children’s children depend on it.